One of the original employees of CNN, Rick Davis, SPA ’74, has spent his career in the journalism field. This past fall, he was inspired to help AU students who are following the same path. Working with the School of Communication, Davis established the Nick Charles Scholarship to honor his friend and legendary sportscaster, and increase diversity in the newsroom by supporting students of color who need financial assistance pursuing a career in journalism. You can join Davis and help diverse journalism students by supporting this scholarship fund. After graduation, Davis knew he wanted to be a journalist but with a degree in government, he thought his path was uncertain. Through an AU connection, Davis took a job as a stats taker for DC’s NBA team, known at the time as the Washington Bullets. While making only $15 a game, he met all the sportscasters in town. Realizing they had a short window to create the day’s highlights reel in time for the 11 o’clock news, Davis entrepreneurially seized the opportunity to make himself known. “I started calling them after the games, giving them the best stats from each game – the plays, the dunks for the highlights package,” Davis explained. As he got to know the sportscasters, over the phone and at the games, he began inquiring about openings at their stations. He got the break he needed when Nick Charles from WRC-TV told him about an opening there. And so with Charles’ help, he got the interview – and at age 25, Davis landed his first journalism job just down the street from AU at WRC. Starting as a part time, entry level production assistant, Davis put in long hours and eventually made his way up the ranks, working with Charles in the sports department and then as an assignment editor. In 1980, Ted Turner envisioned the first ever, 24 hour news channel and Charles was recruited as CNN’s first sports anchor. When the time came to hire the executive producer, Charles recommended Davis. Davis joined his friend Charles at CNN for its launch. They drove down together from Washington in late April 1980 and only five weeks later, Davis was the executive producer for the second hour of CNN on Sunday, June 1, 1980 with Charles co-anchoring that night’s CNN Sports Sunday program. 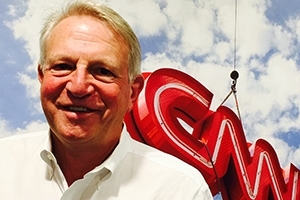 After 35 years, Davis is still at CNN, serving as the executive vice president of news standards and practices where he ensures news gathering is fair, accurate, and responsible. Due to Charles’ significant impact on Davis’ life, and in memory of his universally kind demeanor, Davis chose to honor Charles with a scholarship in his name. Charles, of Greek-Italian ancestry, who grew up on the south side of Chicago and drove a cab to pay for his college education, was an inspiration to Davis. The Nick Charles Scholarship aims to increase diversity in newsrooms by supporting AU students of color who have financial need and are pursuing a journalism degree in the School of Communication. Davis was inspired to support AU because as an alumnus, he is “very proud of AU’s growth and development as a major selective university.” Impressed by the journalism program and the advancement of the campus, faculty, and student accomplishments, Davis decided he wanted to give back. To Davis, AU offered opportunities beyond the classroom. It was at AU, on his freshman year hall, that Davis made friends he’s stayed in touch with for the past 46 years. If you would like to support diverse students entering the journalism field by giving a gift to the Nick Charles Scholarship, please contact 202-885-5900 or giving@american.edu, or you can always make your gift online. The inaugural recipient of the Nick Charles Scholarships is Mawal Sidi, SOC '18. Sidi is studying broadcast journalism with a minor in international relations. She greatly appreciates this scholarship support and echoes Davis' spirit of giving back, "I believe as one becomes successful they mustn't forget others, because true success is never achieved alone. Someone had to believe in your dreams and encourage you to chase them."